If you have the misfortune of playing Rainbow Six, you'd better get used to this screen -- you'll be seeing it a lot. 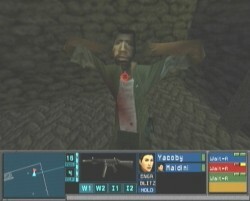 Granted, Rainbow Six's realistic difficulty was one of its selling points on the PC, but the Dreamcast version's insanely bad controls make it impossible! You move using the A, B, X, and Y buttons. A, the bottom button, moves you forward, while Y, the top button, moves you backwards. Why do you press down to walk forward? I have no idea. Holding down the L trigger while moving picks the pace up to a run. The R trigger fires your currently equipped weapon, and the Analog Stick looks around. That leaves the D-pad unaccounted for. Every possible combination of the D-pad and another button makes you do something: D-pad left + B button switches to your secondary weapon; D-pad down + Y button toggles 3rd person view; D-pad right + L trigger lets you control a different team member. The amount of button combinations is nauseating, especially considering the split-second reaction time Rainbow Six requires. Stephen Hawking would have a hard time remembering all these damn functions. The worst combination? To give a "Go" command to a teammate, Rainbow Six actually makes you press the L trigger + the Start button + the A-Y button that matches that teammate's color - A for Red, X for Yellow, etcetera. Combine the hellish difficulty with some of the worst load times I've ever seen, and Rainbow Six becomes the first disc I've been tempted to bite. Each menu takes considerable time to load, and navigating them is unbearably painful. The interface is so slow and clunky, it sometimes takes three button presses just to change the highlighted option. R6 takes so long to load levels -- even single room training missions -- that you can go to the store to pick up a six pack before the game starts up. If R6 is going to make you re-start and re-load completely every time you die, it should not be so frustratingly difficult. I can't stand -- strike that -- I hate the level loading screens. I've spent the majority of the past few days watching a rotating R6 that looks like something from an early Genesis title. After waiting this long for levels to load, I expect breath-taking graphics. With Rainbow Six, I get nothing but outdated crap. Rainbow Six hit the PC in 1998, and it shows. All of the characters are jagged and unnatural. A counter-terrorist doesn't even hold his gun properly; it sticks out of his hand in an awkward position, with his fingers noticeably distant from the trigger. You'll really notice the weak graphics when you get close to a dead terrorist. That's when you realize they look like origami, or a really poor Lego creation. Adding injury to insult, in Rainbow Six the use of the jump pack doesn't seem to have any relation to what's happening in the game. I fired my MP-5 in the shooting range and nothing happened. I was standing still, and about five seconds later the crazy thing started vibrating. There doesn't seem to be any rhyme or reason to it; at random times, Rainbow Six just decides your hand should shake. Majesco didn't waste any energy adding good sound effects to an otherwise pathetic game. No, they re-used the same exact voices and sounds as the PC version. Don't get me wrong, the voice acting is fairly well done. However, without ambient effects to balance it out, R6 is unconvincing. Simple sounds in the distance are important to estabilshing the feeling that this is part of a larger world, but Rainbow Six fails to deliver them. Despite all the realism Rainbow Six pumped into its combat engine, it sacrificed the basic elements of a real world. The entire time you will be acutely aware that this is nothing but a video game. 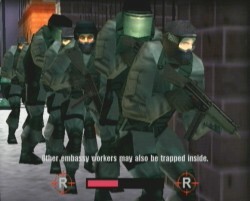 It was a bad sign when Majesco continued to delay Rainbow Six for a week at a time. If they had simply recognized the multitude of problems on September 9th and allowed a few months to resolve them, perhaps it would have been a decent game. As it stands, I've had surgery that was more enjoyable than Rainbow Six. Highs: Realistic counter-terrorist weapons and scenarios. Lows: Hard to play, hard to control, hard to look at, hard to not use as a drink coaster. Other: 1 Player, VMU Compatible (4 blocks per campaign), Jump Pack compatible.